There is growing group in the US, who say anything that did not originate in the US, or Christianity, is not worth doing, such as yoga. It seemed like a headline ripped from the pages of a satirical publication: Does yoga make you demonic and less of a Christian? Of course, every story from Trump’s America practically reads like farce, but this question had a curious staying power, in part because it reveals a lot about the things, and the people, perceived as “foreign” in the US right now. He is also a part of a growing group in the US, many of them highly educated, who posit the idea that anything that did not originate in the US, or in Christianity, is really not worth doing, such as yoga. The ironic thing, many pointed out, is that yoga, at least the way it is commonly practiced around the world, might have originated in the US. Andrea R. Jain, the author of ‘Selling Yoga‘ and a professor of religious studies at Indiana University, writes that yoga became popular in the US in the 1960s as a counter-culture movement that offered a different, and less rigid, form of spirituality, a stark contrast to Christianity. In the early days of yoga, she points out, many Christian preachers expressed similar anxiety about yoga, warning that it was a “pagan” tradition and would lead people away from Christianity. Churches tried to co-opt yoga but with little success. Yoga changed, Jain argues, as it was later mass-marketed and exported around the world as a sort of Americanised, body-toning version of an ancient tradition. Today, yoga’s modern roots, it turns out, are a sort of amalgamation of Hindu, Buddhist, Jain, and American ideas. However, that did not stop the Hindu American Foundation from launching its 2008 campaign called “Take Back Yoga: Bringing to Light Yoga’s Hindu Roots”. They argue that “the mass commercialisation of this ancient practice, rooted in Hindu thought, has become concerning”. 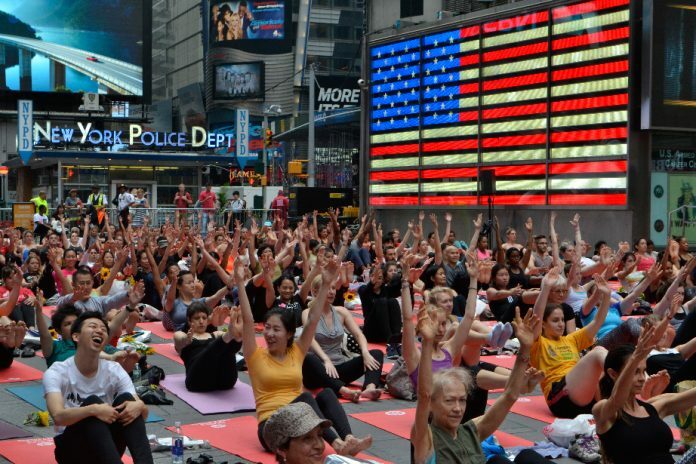 While some might dismiss this group as being overly sensitive, much of their complaint is rooted in a very real grievance about minority representation in America, where a white person’s take on yoga is seen as holding more weight and authority than that of an Indian, who is often made to feel like an exotic “other” in some American yoga spaces. Indeed, few things are odder to experience than being in a small town in America, in which you do not feel welcome or even safe as an Indian American, all the while seeing a room full of white people around you chanting “Namaste”. Today, yoga is a $10 billion industry in America, with variations from dog yoga to marijuana yoga. Still, every few years, a conflict brews in America over the origins—and the religious significance—of yoga. In 2015, a Christian family in California tried to block a public school from teaching yoga, arguing that it was a form of Hindu religious indoctrination. The courts responded that yoga is simply mainstream culture now in America, a sort of vanilla product that can be served in a multitude of ways. Still, yoga remains a wedge issue in the US, both on the Left and on the Right, and I suspect it will remain one, so long as there are white Americans who worry about the “foreign influence” of things like yoga, as well as Indians who feel like their identity is still tokenised in America. Zahir Janmohamed is a Senior News Editor at Hyphen magazine and a fiction writing fellow at Kundiman. Next articleWhy is Sabyasachi shaming women who can’t drape sarees but not men who can’t tie dhotis?